Having a pool can be a wonderful thing where you are able to enjoy endless hour of fun with your friends and family. It needs to be maintained though and a large part of that is to be able to keep the water moving with the best pool pump possible. There are a few reasons that you don’t want stagnant water in your pool and the best swimming pool pump will help to keep bacteria at bay and help to run the water through your filtration system. When deciding on which product to buy, there are many key aspects to consider. This pump is designed for above ground pools. There is natural sand contained inside, which the water is filtered through. As the water goes through the sand, the impurities are filtered out, leaving your water clear and fresh. There are also a number of functions which the pool pump can control. There is a control valve which allows you to set the pool pump to filter, backwash, rinse, recirculate, drain, and more. You can also completely close the system when you need to. There is a 24-hour timer on the system, which helps you to effectively manage the filtering of the pool over the course of a day. The pool comes with an included strainer basket, which the water passes through before the water gets to the sand. This offers filtering of larger particles and helps to elongate the life of the sand, and of the pool pump. This pool pump has a flow rate of 2800 gallons per hour. When you are using it for your above ground pool, it will effectively pump water from a pool up to 16’ long. The thing we love about this pump is that it requires virtually no maintenance. 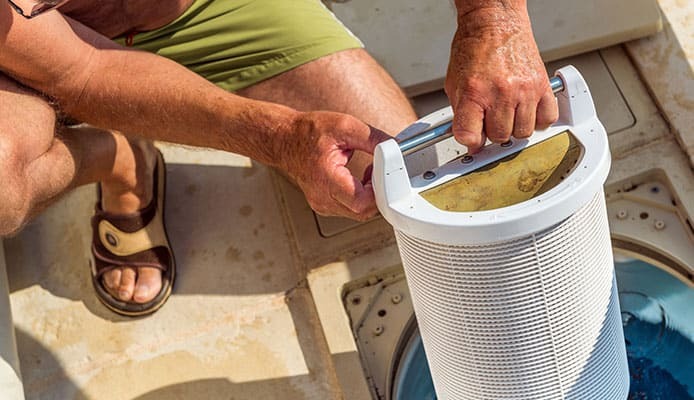 Every 5 years you should replace the sand in the filter, but apart from that, you should not need to do any regular maintenance. 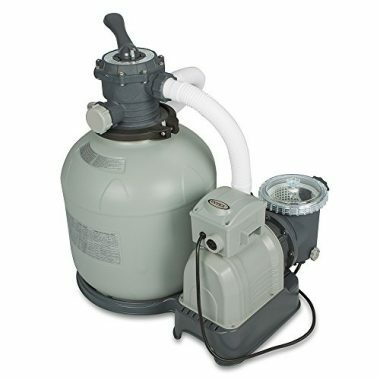 The powerful motor on this pump will work for most backyard pools, and the strainer and sand filtration system will keep your pool looking crystal-clear. We like the 6-way valve, which gives you complete control over the functionality of this pool pump. This pool pump has been designed to be used with above ground pools or pools which sit on the ground. It is a larger pump than some on the market, filtering more water for larger-sized pools. There are also a lot of nice features which make this filter one to look at. The strainer is industrial-sized as it is able to pick up large debris and has a large enough size to collect a large quantity before you have to empty it. The motor is also large and heavy-duty. The motor will perform well for a long time and has an automatic thermal overload protector which will kick in and keep the motor safe when needed. The high-performance impeller has wide openings. This means, that if large debris does get through, they will not clog up the impeller. If an impeller does get clogged, then it will stop working, and the strain could damage the water. There is also a quick disconnect intake and discharge pipe connection. 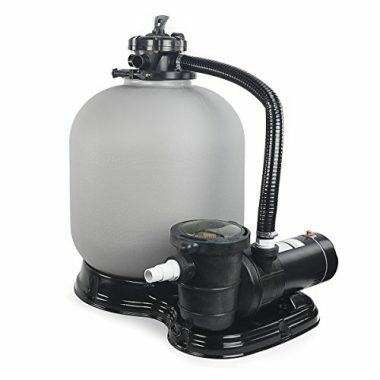 This is a great pool filter for a larger pool or a commercial pool. There is almost no maintenance required except for emptying the strainer. It also performs better than a lot of pool pumps on the market. This is an above ground pool pump which is affordable and efficient. When you compare this humble pool pump to some of the similar pumps out there, especially the big name brands, this pump offers great results at a fraction of the cost. The materials used are heavy-duty and corrosion-proof. The stainless-steel motor shaft has been designed and constructed for durability. The reinforced thermoplastic body only adds to the toughness of the motor. We love that this is one of the most efficient pumps on the market. It is also one of the quietest. When this pump is running, you will hardly even notice. 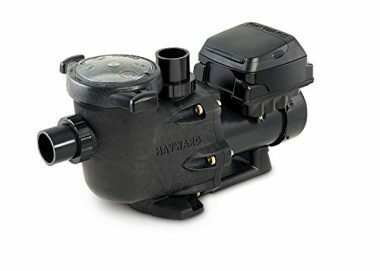 The only thing you need to make sure with this pump is that it is used with a permanent pool. This is an easy pump to use. The lid of the strainer is see-through, so you can see at a glance if it needs to be emptied or not. It also features a twist and lock system, so it is easy to get in and out of. Overall, this is a very easy pool pump to install and use, with the noiselessness being the main feature of the pump. This is a variable-speed pool pump which offers you great functionality and performance. The pump is Energy Star certified and complies with most local regulations. In fact, using this pool pump will usually get you a rebate from the government. The efficiency also makes it one of the most eco-friendly pumps on our list, and with pumps, eco-friendly means more money saved each month. We love the performance of this pump. The power can fluctuate between 1.5 and 2.0 HP. If you are replacing a high-performance pump, then this one is perfect. If you need a high-performance pump for your large pool, then this one will do the job. The magnetic motor gives you a lot of power without a lot of energy or noise. The motor is also completely sealed, meaning that it is safe from any outside harm. The fan keeps the motor cool and performing as it should. We love the digital interface, which is completely programmable. It can also rotate to four positions, so when you are installing the pool pump, you do not need to have it placed in an exact way. The extra-large basket also makes it easy to trap a lot of debris and empty that debris with-out taking up too much of your time. This is an easy to use pump which will save you money. This pump is very easy to install, even though it is an in-ground pump. The pump can also be used with in-ground pools and above-ground pools. We love that versatility. Once you have this pool pump installed, you will not need to worry about it. It is easy to maintain, and you may even forget that it is there due to how quietly it operates. The pump is also high-performance, and offers you an efficient filtering system which will not put a burden on your bank balance each month. The trap is easy to access and easy to empty. No matter what is in your pool, the trap is going to catch it. The great thing about this pump is that it will also work in any season. You do not have to worry about the heat or the cold affecting it. This pool pump comes with a replacement O-ring. Anything which comes with replacement parts is great in our opinion. When common problems occur, it can be hard to find the right part, and you can often find yourself searching online for hours. With a replacement O-ring, you can replace a worn one without having to order any new parts. This is an above-ground pool pump which gives you great performance at a great price. The pool pump is specifically designed for above-ground pools and will filter a large amount of water every hour. The elements are corrosion resistant and have been designed to stand up to the elements. The motor itself is drip-proof, heat-resistant, and the double-sized seal keeps everything you do not want, out. The high-performance impeller provides you with a constant and consistent flow to keep the motor working for as long as possible. When it does come time to clean the pump, there is a handy see-through window on top of the strainer so that you can see if it is full at a glance. The convenient drain plug also makes maintaining the pump a breeze. This is an easy pool pump to use and to maintain. We love that it comes with a replacement part to make things easier should you need to fix the pump at all. 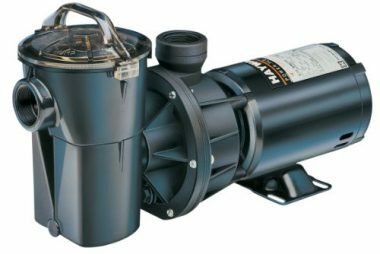 This is a heavy-duty pool pump which features a stainless-steel motor shaft and a thermal overload protector. The stainless steel is tough and durable and will last. The protector helps to stop the motor from being damaged. The two together help to protect this pool pump from breaking down, keeping your pool free of bacteria, debris, and algae for years. We love that the motor is drip-proof, heat-resistant, and sealed from the outside world. 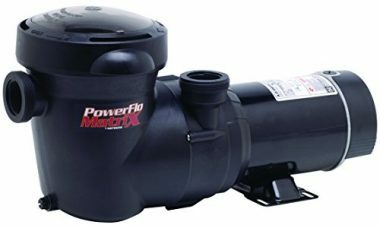 This is a really easy pool motor to use, and one which will ensure the health of your pool water. This pool pump has been designed to filter water through the sand inside. There is enough space for 175 pounds of sand, which means that you can filter a lot of water. When the water passes through the sand, any small particles will be filtered out, and the result will be clear and clean water. The pump is also big enough to filter 4500 gallons per hour. This pool pump is also easy to install, and you should be able to do it yourself if you are confident of taking on the task. There is also a 6-position valve which lets you control the exact function of the pump. Overall, this is an easy pump to use when it is installed. There is a basket to catch any large debris, which you will need to empty occasionally, and the sand will not need to be reapplied for many years. 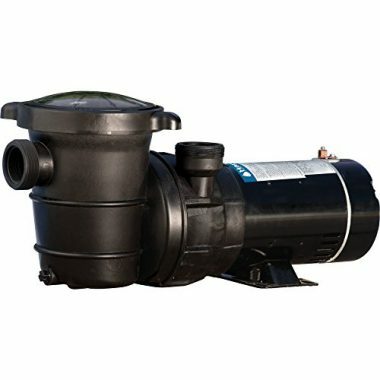 If you are looking for a heavy-duty pump for your pool, then this will cover your needs. If your state has laws regarding the energy consumption of your pool pump, or you want to conserve energy and save yourself some money, then this is the pool pump for you. This is one of the most efficient pumps on the market, with the variable-speed helping to cut down on your energy bill costs. he built-in time clock also helps to regulate when the pool pump is on and when it is off. These two things come together to help create an efficient pool pump, which will save you money in the long-term. This pool pump may be one of the most expensive on our list, but it is also one of the cheapest to run from month to month. If you are looking for a pump which is better on the environment, then this is a great pump which will conserve energy and save you money. This pool pump is compatible with intellitouch, easytouch, and suntouch pool control systems. This means that you can hook up your pool pump to some common and compatible control systems and open up the pool pump to full control of the operation. As well as being able to have more control over the pool pump, you will also have access to the diagnostics of the pool pump. You will be alerted to any possible overheating, freezing, failure, and power surges. This extra control over everything in the system helps you to maintain your pool pump for longer and to save you money. You are finding problems before they hurt your pool pump, and you are using less energy on a daily basis. We love that this is a variable-speed pump. With 4 speeds, you can save up to 90% a month when compared to a single-speed pool pump. The pump is also one of the quietest on the market. When you do get your control system hooked up, you can turn the pump on and off, change the speed of the pump, and choose the operation of the pump. You can filter, heat, clean, and more. If your pool pump is hooked up to your hot tub, then you can even turn the water jets on and off with this pump. This is the perfect pump for anyone who wants complete control. The speed of your pump will be dictated by the needs of your pool. It will also be affected by the size of your pool. There are three options when it comes to the speed of the pump: single-speed, dual-speed, and variable-speed. Each speed of pump has benefits and disadvantages, and each offers varying features. A single-speed pump only runs at a single speed. This top speed uses more power than lower speeds, which means that you will spend more money on energy. This money may be worth it, though, as the pump will effectively filter your pool constantly. Single-speed pumps are also easier to take care of. If you are well versed in pool maintenance, then you may be better with a differ type of pool pump as they will save you money in the long-run, but if you want something which can take care of itself, then a single-speed pump is the way to go. A dual-speed pump gives you the option of a high speed and a low speed. Using the high-speed option is the same as running a single-speed pump. The lower speed gives you an option which will save you some money. As there are more options, the dual-speed pump needs a little more maintenance than the single-speed pump. A variable speed pump will cost you more to buy but will save you a lot more money in the long run. The magnetic motor costs you less to run, and there are a variety of speeds instead of having only one or two. With a very high speed, you can filter the water extremely quickly. The low speeds do not need a lot of power and can maintain your pool after filtering. The pump will cost more to maintain, and repairs could cost a lot more than a single-speed pump, but if you take care of your pump, then you will not have any problems with it. You do not need to buy a pump which is designed for a much larger pool as you will only be wasting your money. A larger pump does not mean that it will filter the water quicker or better, it only means that it will be capable of handling more volume of water. If you buy the right size pump, then the water will be filtered correctly. The opposite goes for a pump which is too small. You may want to save some money, and buy a smaller pump, but if it is not rated for your pool, then it will not be able to filter all of the water, and your pool water will become contaminated. You should always try to find a pool pump which fits your pool or is slightly larger. If you buy a bigger pump than needed, then not only will you be spending more money initially, but you will also be spending more money each month than you need to. With a smaller pump, you will spend less initially, and less each month, but you will not be filtering your pool water, and the water can become dangerous. To find the size of the pool pump you need, you first need to know the number of gallons in your pool. You may already know this, but if not, then you can find the information in the user guide or online. To get the needed flow rate, you need to take the total number of gallons in your pool and divide it by eight. This will give the flow rate. Most pool pumps are rated in terms of gallons per minute. To get the right pump, take your flow rate and divide it by sixty. This will give you the rate per minute. From this number, you can choose the correct pump. Pumps come as either above ground or in-ground, but this does not necessarily mean that this correlates with an above ground pool and an in-ground pool. It may be that an in-ground pump will be easier to install with an in-ground pool, and an above ground pump will be easier to install with an above ground pool, but you do not need to do this. Both types of pumps can be installed with both types of pools. There are differences between the two types of pumps, which you should definitely know about, but you do not necessarily need to choose only one type. In-ground pumps are self-priming. Above ground pumps are not. So, what does this mean? In-ground pumps are lower down and need more power to lift the water. Above ground pumps can rely more on gravity to add to the pressure of the water. This means that you will use slightly more power with an in-ground pump. The difference in level between the pump and the surface or the water will dictate how hard the pump has to work. In-ground pumps will generally have a higher flow rate. When you are choosing the flow rate for your pool, you need to make sure that you get it right so that you are able to filter all of the water in your pool, but you are not wasting energy doing so. For pools which require a large flow rate, you will be more likely to choose an in-ground pump. The main thing you need to look at when you are providing power to your pump is the voltage. There is no point in choosing between hardwired plug-in before you know the power needs. Some pool pumps will require a higher voltage than your regular sockets, and you may have to run a special line to your pump. If this is the case, then you will need to plan ahead before you go ahead and buy a pool pump. Once you have determined the voltage and whether or not you can supply it, you should look at plug-in vs. hardwired. Your pool pump may need one or the other. Either way, you will need to ensure that there is a power supply which can run to your pool. You may need to wire a socket right by your pool, or you may need to run a cable from your pool pump to your fuse box. When you are chasing your horsepower, you should make sure that you have enough voltage to run it. If you do not have the voltage for the horsepower, then your pump will be useless. There is also no point in having a high horsepower pump if you are not going to need all of that power. If you are wasting energy in powering your pump, then you may as well throw your money down the drain. You also do not want to waste energy. A pump which is too high horsepower can also damage your filtration system and any other accessories attached to it. If you are pumping the water through at too high a rate, a filter or heater may not be able to deal with it, and you may end up damaging your pool equipment. The voltage is important when you come to buy your pool pump. Most pumps will use 110 volts or 220 volts. You may have one or the other, or you may have both. If you have both close to your pool, then you do not need to worry about what type of pool pump you buy, but if you do not have one, then you have to be pickier. Of course, you can always hook up power to your fuse box if you have the room. You should not let the voltage put you off buying the pool pump you want, but if you cannot supply a certain voltage, then some pumps will be off limits to you. Q: What Is A Pool Pump? A: Your pool pump is the heart of your swimming pool. All of your water will flow through your pool pump. The main purpose of the pool pump is to take the water from your pool, draw it through the main drain, pool skimmer, and pool filter, and then pump it back out into your pool. When you combine a pool pup with a heating system, you have everything you need to take care of your pool and keep it heated. 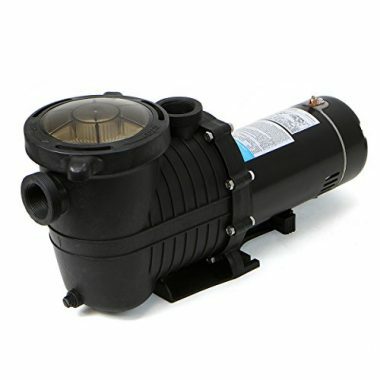 When you are looking for a pool pump, you should be familiar with the main parts of a pool pump. There are three main parts to a pool pump, and they include the motor, the impeller, and the hair and lint trap. Let’s look a little closer at each of the parts. The motor is where the magic happens. The motor is what does the work to pump the water from the pool and to the pool. Most of the pool pumps you will find have an electric motor. This motor will either use 110 volts or 220 volts. They also usually spin at 3450 rpm. A pool motor can heat up a lot, so it is not sealed off from the outside world. Part of the pool motor is left open so that air can flow around the motor and cool it. As there is part of the motor left open, you need to be careful. You are around water, and water and electricity do not mix. When you are installing your pool water, make sure that you do not place the motor in a place which can be hit by any water. Check where the cooling vents are placed and do your best to protect those areas. The impeller is the second main part of your pool pump. As the name may suggest, the motion is similar to a propeller. The impeller is attached to the pool pump and generated water pressure through centrifugal motion. As the impeller spins, pressure is created, drawing the water in and forcing the water out. The impeller is what is responsible for moving the water in and out, but the impeller is driven by the motor. The last part of the motor is the hair and lint trap (of course, there are a lot of small parts in a motor, and we are generalizing a lot). The hair and lint trap is a non-moving part and is there to protect the motor and the impeller. If any debris gets into the impeller, then the impeller will not work as it should, and it could break down completely. By preventing any hair, lint, and large particles getting into the pump assembly, you are protecting the pump from harm and ensuring that your pump lasts a long time. The hair and lint trap is the most important part of your motor for saving you money. When no particles get into the pump, the pump runs for longer, does not need to be fixed, does not need replacement parts, and does not need to be replaced completely. 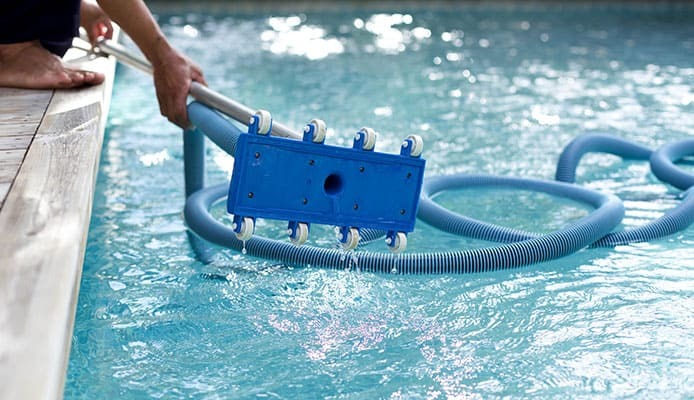 A pool skimmers is used for the purpose of cleaning a pool, but this only used in conjunction with a pool pump A pool pump will protect your pool and ensure that you do not have to pay for unnecessary maintenance of repairs. When the water circulates it does not stagnate. The filters in the pool pump also filtrate and remove any impurities. They also help to distribute the chemicals in the pool to ensure that your pool is sanitized and clean. You will also need to get the best pool cleaner and there are many great types of pool cleaner on the market. You also want to prevent debris from getting in your pool too. Not only can this be horrible when you have to work out how to get rid of water bugs in your swimming pool but preventing debris and bug won’t put such a strain on your pool pump either. Using a pool cover is a great way to for this or if you want additional benefits, there are also come great solar pool covers available too. Some people give up on covers though as getting them on and off can be a hassle but that’s where a pool cover reel can help. Without a pool pump in your pool, the water will begin to stagnate, and algae can start to grow. Germs and bacteria will also grow in your pool. It does not take long for a pool to become unsafe for people to be in the water. If someone touches the water, then they can get an infection or a rash, but they could have a worse reaction if they swallow the water. The dangerous thing is that germs and bacteria cannot be seen. If you are running a commercial pool, this is extremely important. You do not want to subject your friends and family to an unsafe pool, but making a pool unsafe which is open to the public can lose you your job if you are taking care of it. It’s also important to know your basic pool chemistry too in order to keep everything in check and how to use a pool test kit to check water quality. 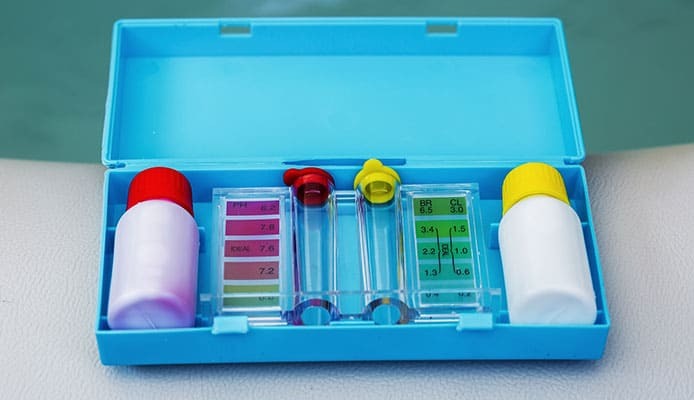 Using a pool test kit will give you reassurance that everything is fine with your pool. Q: What Is The Difference Between Above Ground And In-Ground Pool Pumps? A: When it comes time to buy your pool pump, you will need to know many things, but one of those things is choosing an above ground pool pump or an in-ground pool pump. The type of pump you choose will come down to personal preference, and the different features will help you to make that decision. An above ground pool pump has a large filter basket. This basket is used to catch any debris which is in the water. 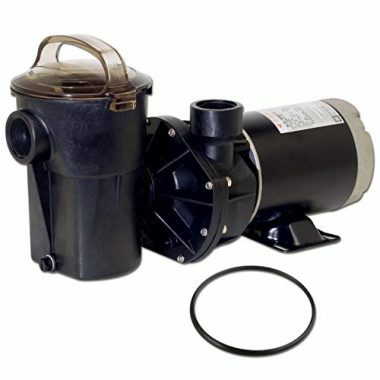 An above ground pool pump also has a high-capacity motor. This high-capacity pool pump has an overload protector, which means that there is less which can go wrong with the pump, and less maintenance and repairs are required. Less maintenance means that this type of pool pump is easier to use for most people. With an above ground pool pump, you also get a high flow. The higher flow means that the cycle runs quicker and you get more filtered out in less time. An in-ground pool pump is cheaper than an above-ground. These pumps are even easier to use than the above ground pumps. These two reasons make in-ground pumps attractive options, but you also need to add the fact that in-ground pool pumps use more energy, so you will have to spend more money over time running the pump. When it comes time to choose your pump, a lot will also depend on where your pool is. You may not be able to install an in-ground pump, so the option is limited to one. You may have the reverse. Take the time to understand your needs, and choose the pump which is right for you. Q: What Is The Difference Between Single-Speed, Dual-Speed, And Variable-Speed Pool Pumps? A: A single-speed pool pump, as you may have guessed, only runs at one speed. The pump uses an induction-style electric motor to drive the pump, and you will not be able to vary the sped at which the pump pumps. You will have a switch to turn the pump on and off, and when you do turn it on, it will run at 3450 rpm. You may also have guessed that a single-speed pump is the oldest technology of the three pumps. Before speed was able to be varied, it was set at a single sped. Single-speed pumps work, and they work well, but there are a few drawbacks. Obviously, you can only run them at one speed, but the unit usually makes a lot of noise too. The motor uses electromagnetic induction to spin the motor, and this makes noise. The pump itself is usually cheaper than other types on the market, but they are more expensive to run. The pump uses a lot of energy, so your utility bill will be higher each month. On a more positive note, because a single-speed pump can do less, it is easier to use and take care of. A single-speed pump will need less maintenance than other types of pumps. A dual-speed pump works in a similar way to the single-speed pump. They both use an induction-style electric motor. The only difference is that the pump can operate at a high-speed or a low-speed. Single-speed pumps operate at 3450 rpm. Dual-speed pumps can pump at this speed, but they also operate at 1725rpm. There is a frequency inverter or toggle switch to move between the two speeds. You now have options with a dual-speed pump. The low speed can be used for basic filtration of your pool, and to circulate the water in your pool. The higher speed can be used to run the pool heater or when you need to vacuum the pool. When you compare this to a single-speed pool, you can see how it can save you money. By using a lower speed some of the time, you can save on your energy costs. It also gives you more options when you want to run your pool pump. Variable pool pumps are the most expensive pumps of the three, but over the long-term, they can save you more money overall. 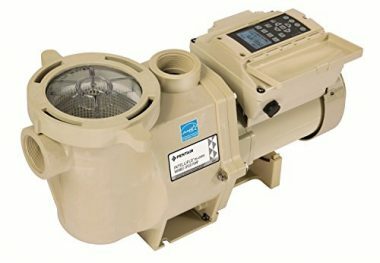 One of the best features of a variable-speed pool pump is that they can be set to run at only specific times through the day, and for fixed periods of time. When you do set the pump to come on, it can pump a large volume of water in a short period of time. You can have the water filtered and heated in a short period of time. When your pump is not running for a long period of time, you are using less energy over the course of the day. Less energy means less expense. You will notice over time that you will spend less each month, and even though you spent more money initially, you will spend less money over the course of a year. A variable-speed pump is a more difficult pump to size and fit to your pool. When you come to buy one, you will need to shop around a little bit to find the one which is perfect for your pool. The pipes can be different sizes, so make sure that you know the sizes of your pipes before you begin shopping for a pool pump. 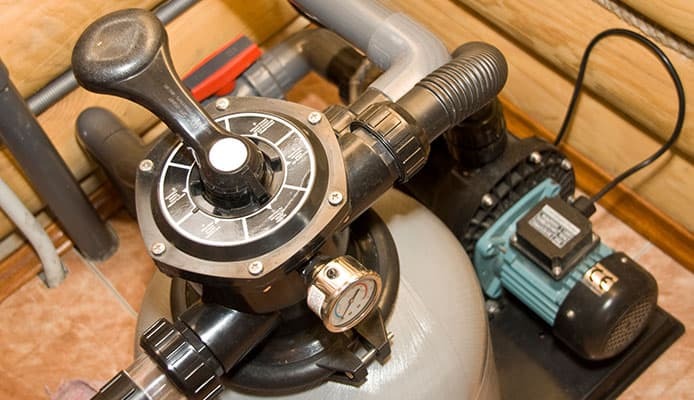 A variable pool pump also requires a 230-volt power supply. If you do not have this, then you may have to run a power supply line to your pool. A variable-speed pool pump offers you a lot of flexibility over the water in your pool. They will cost you more initially, but less in the long-run. You will need to be more careful when you are shopping for one to ensure that it will fit with your pipes and hoses. Variable pool pumps are also the most difficult to take care of. More flexibility means more maintenance needs. When you are shopping for a pool pump, you need to look at all of your options and make sure that you are fitting your needs. Shopping around a little will save you money initially and in the long run. 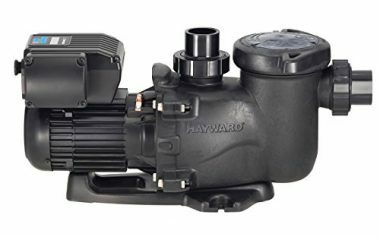 Take a look at our list and find one of the best pool pumps on the market. Unless you are refilling a pool every day, you need a pool pump. Keeping that water movement is essential for a number of reasons as we have seen. There is a lot to consider but with the information provided here, you’ll be able to make the best choice. Our buying guide explains everything to you, and our list highlights the features of the ten best pool pumps on the market. Take the time to know what you need, and save yourself time and money with the best pool pump.